Datamars Textile ID received a memento from Voyantic to celebrate the delivery of their 500th RFID test system. Home/Memberships & Partnerships/Datamars Textile ID received a memento from Voyantic to celebrate the delivery of their 500th RFID test system. During the last years, Datamars’ LaundrychipsTM have continuously outperformed the market growth – especially after the introduction of UHF ones – thanks to a constant innovation and a systematic focus on quality that is widely recognized by our customers. A fundamental contribution to Datamars transponders quality has been provided by Voyantic test equipment in both design and production phase (performance characterization and reliability tests). Voyantic is the global leader in performance measurement solutions for RFID and Datamars has made large use of both Voyantic lab equipment (Tagformance) and test production equipment (Tagsurance) since 2012. During the design phase of our products, Tagformance provided fundamental information (such as the transponder frequency response, both in single read and in bulk) thanks to which we took the right decisions about the new product up to the slightest detail. With Tagsurance systems, Datamars can guarantee the electrical performances of 100% of its UHF products, with a clear advantage in terms of quality perception of the end user. “We appreciate having had Datamars as our valued customer during the past 5 years. It has been a pleasure to see Datamars decisively investing in RFID quality and utilizing Voyantic solutions from tag design and performance verification all the way to high volume production testing” says Harri Tulimaa, Vice President of Sales at Voyantic. 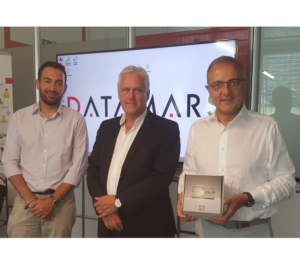 The 500th Voyantic’ system was delivered to Datamars production facility in Thailand, where several Voyantic testers have been integrated in the production process, and to celebrate this milestone Mr. Harri Tulimaa on June 27th handed over a memento to the Datamars team in Lugano, Switzerland as a token of appreciation and dedication for RFID quality that both companies embrace and foster in their strategy and operations. For more information about Voyantic please visit www.voyantic.com/. Picture: Antonio Gallizzi (Datamars), Harri Tulimaa (Voyantic) and Gianni Tognetti (Datamars) in Bedano, Switzerland.